We’re a quarter of the way through the season and we just beat the team with the league’s best record, so I figured now might be a good time to write an update. Our record (16-7) is encouraging, but what’s more encouraging is that we’ve had significant injuries and it hasn’t stopped us. The fact that starters like Will and Gary have been out and we’ve been able to win games says a lot about where we’re at. The bench is playing well. We’ve won road games. We have a group that’s able to enjoy it, but knows that there are 60 games left. All positive signs. I’ve always admired teams that have been able to consistently win year in and year out. This has been a good start, but that’s where we are trying to get to. 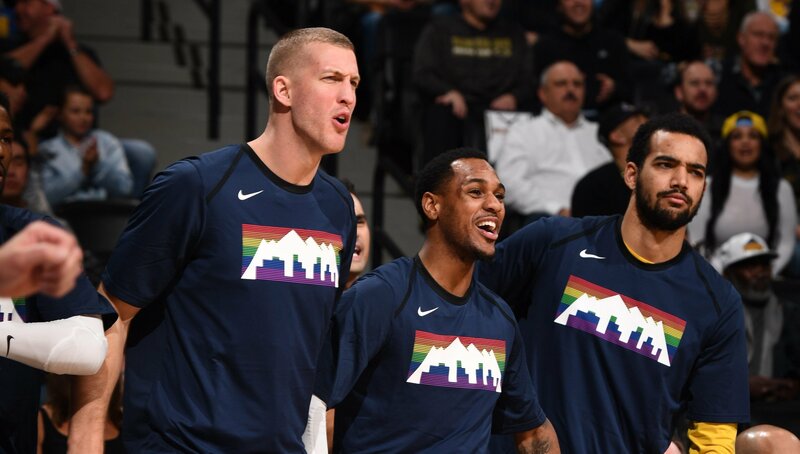 Being one of those teams that you know you’re always going to see when you look up in the standings. Paul’s tip-in to beat the Bulls. It’s always fun to win on a buzzer-beater and this one came in a tough road game. Shout out to P on Player of the Week honors. Juancho dunking on JaVale McGee. Juancho has had a great start to the season and he’s been a big reason why we’ve been able to weather the injuries. Coming to the bench after the dunk he said, “I’m so happy!” Hahah, we know Juancho. Thomas Welsh’s three-pointer for his first NBA points (followed by jacking my celebration when I hit a three earlier this season). Scoring those first NBA points is exciting and I’m glad that our rookies have gotten them in wins. It’s definitely more fun when you can do it front of a cheering home crowd. (My first points came in a blowout loss to the Magic in Orlando.) Thomas is a great kid and has a powerful story. He’s a guy who’s easy to root for. I would say the biggest surprise this season is how good our defense has been. Everybody keeps asking what has changed since last year. To be honest, I don’t know — maybe guys are just playing harder. And half the battle on D is taking care of the ball on O. Fewer turnovers and better shot selection alone has led to us being a better defensive team. I thought it was kind of crazy when we went into training camp and I was waiting to see if we were going to do things differently, and the coaches were like, “no.” Hats off to Wes Unseld for sticking with the plan. It’s the most efficient we’ve ever been on the defensive end. The biggest regret of the season has been losing twice to Milwaukee. We can’t go 0-2 to another Eastern Conference team. Thankfully, we already have good wins against Eastern contenders like Toronto and Boston. The next Boston game is going to be a big one. I thought Jamal’s shot was fine, but now we have to go there and play really, really well because after he dribbled around Lonzo last year and pissed off the Lakers we went to LA and got beat. I’ve never had 48; hard to speak to it. I hope everyone had a Happy Thanksgiving. Mine was spent with family and friends in Denver and it was nice to get everyone together for the holidays. Speaking of holidays…The only holiday you should be in San Antonio for is Cinco de Mayo. Thanks to NBA scheduling, I’ve spent the last two New Years in San Antonio and this year we’ll be traveling there on Christmas Day — the “jewel of the NBA regular season.” I wouldn’t be mad if we got to play on Christmas next year. I heard Dame lobby for it last year and noticed that the Blazers are playing Utah in the Christmas nightcap, so I’m going to throw it out there. If you’re going to send us to San Antonio for the holidays, at least let us play in front of a national audience. Better yet, let’s do it in Denver.